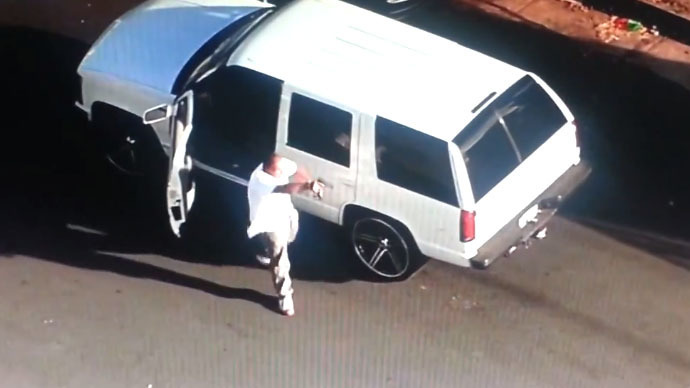 A car chase between police and an armed kidnapping suspect in South Los Angeles was aired by local television stations, though this one ended in a dramatic and violent scene – with the suspect leaving his vehicle and engaging in a shootout with officers. Details are still unclear, but the incident began Friday when Los Angeles police identified the vehicle of a kidnapping suspect who was armed with a gun, NBC Los Angeles reported. The Los Angeles Times also stated he was driving a stolen car. It’s also unclear how long the car chase went on for, but the suspect almost struck a skateboarder with his white SUV about 20 minutes in, according to CBS Los Angeles. The chase ended near 43rd Street and Vermont Avenue, when the man slowed down, left the vehicle, and began shouting and gesturing at the string of police cars that were tailing him. Helicopter footage from the event shows that the two sides then start shooting at each other, with the suspect ultimately getting hit as he tried to retreat. The suspect tumbled to the ground but got up and made his way towards a house on the street, which could have been his own. Although he collapsed on the steps of the home, he continued to hold onto his gun, and the standoff with law enforcement continued for another hour or so. According to local ABC 7, SWAT team members arrived at the scene shortly after the shootout and started to evacuate neighboring homes. Eventually, the man walked towards officials with his hands up and surrendered. No other injuries have been reported, and no law enforcement officials were hurt. As noted by The Concourse, local media has polices in place that discourage airing live footage of people being shot, but the incident was aired by all four network affiliates in Los Angeles. For its part, CBS LA pulled away from the scene when the shootout began, before returning when the man began walking to the home.